Boston Underground Film Festival has announced it’s first wave of titles for their eighteenth edition, which runs March 23-27 at the Brattle Theatre in Cambridge, and for the first time, a few selected screenings at Harvard Film Archive as well. They’ve got quite an eclectic list as always (some of them are downright bizarre, but then again, that’s the norm for BUFF, of course) and we’re looking forward to catching a number of titles. More titles will be announced in the near future, but in the meantime, here’s the press release – and keep checking with eCinemaBoston and at the festival’s official site at http://bostonunderground.org for more additions! Titles Include The Lure, Little Sister, Trash Fire and More! 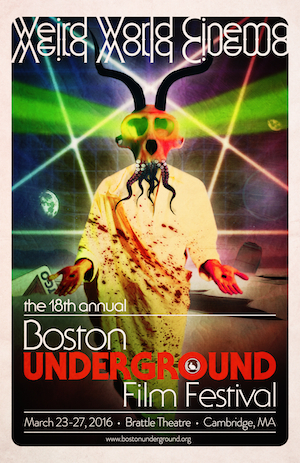 Cambridge, MA – The 18th annual Boston Underground Film Festival returns, bringing with it an onslaught of phantasmagoria and intrigue to the Brattle Theatre and Harvard Film Archive from March 23rd through the 27th. This year’s schedule boasts an eclectic selection of weird, wonderful programming packed with guests both familiar and new, parties, and more! Bookending this year’s festival of madness are Sundance juggernauts The Lure and Trash Fire . Kicking off the festivities on March 23rd at the Brattle Theatre is the genresmashing, absolutely infectious Polish vampire-mermaid, 80s themed horror/disco/musical The Lure, directed by Agnieszka Smoczyńska: Mermaid attire highly encouraged! And closing out the festival’s five days of rubblebouncing insanity is BUFF alum Richard Bates, Jr. ’s nihilistically hilarious Trash Fire , with both Bates and film guest AnnaLynne McCord in attendance! BUFF favorite Frank Henenlotter returns with his latest, Chasing Banksy , a caper comedy about art theft: Henenlotter and cowriter/star Anthony Sneed will be in attendance. For the first time ever, BUFF is thrilled to welcome indie horror legend Larry Fessenden , who will present a special 15th anniversary screening of his cult classic Wendigo on 35mm. BUFF is beyond thrilled to add a trio of weekend screenings at the Harvard Film Archive this year, including a live performance of 2014 Edinburgh Fringe Fest standout Standby for Tape BackUp, presented by Ross Sutherland, who’s taking a break from his current UK tour to bring his not-to-be-missed show to the Commonwealth. Recalling the way Dark Side of the Moon synchronizes with the Wizard of Oz, Sutherland creates his own personal audiovisual meditation using fragments of old movies and television programs from a VHS tape that somehow became the story of his life. Also at the HFA is Sympathy for the Devil: The Story of the Process Church of the Final Judgement , a documentary that explores a religious group that flourished in the 1960s and 1970s, founded by the English couple Mary Ann and Robert DeGrimston, with filmmaker Neil Edwards in attendance. In celebration of homegrown talent, BUFF is pleased to present the World Premiere of Blood of the Tribades , a Jean Rollin-inspired, dreamy 70s lesbian vampire tale, from hometown heroes and local rock’n’rollers Michael J. Epstein and Sophia Cacciola . We’ll have our kidfriendly annual Saturday Morning Cartoons with cereal smorgasbord, programmed by renowned curator and author KierLa Janisse, a bounty of shorts programming celebrating fantastic music videos, animation, transgressive horror, and more! So. Much. More! Individual screening ticket prices vary and will be available online and at the Brattle Theatre box office on the day of screening. Festival passes, which include admission to all films and parties, are available at a significantly reduced rate through BUFF’s ongoing presales Kickstarter, which ends on March 18th . Passes, thereafter, will be available for $175 at www.bostonunderground.org/tickets. Full schedule coming soon to www.bostonunderground.org !